Another three minute guide to a common thought/feeling (a la The 3 Principles). Watch the video below! In it you’ll see I was feeling anxious when I recorded it. Not anxious of recording the video, but anxious of what would happen a couple of hours later when I attended my very first Here and Now Meetup group. Now this Meetup group is all about the people who attend being ‘present’, and sharing their experiences with others – with strangers – as part of that presence. 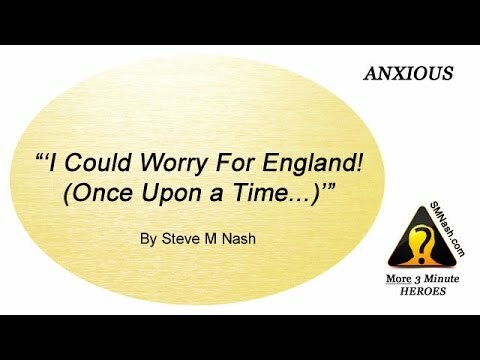 Yes, my thoughts about feeling anxious were anxious – how funny is that (how typical, actually!). And, okay, this was just one example ‘in the moment’ of my anxiety. I’ve been a worrier all of my life, though. I’ve fretted in relationships (and fretting is not the best ingredient for a loving, long-lasting relationship). I’ve not shown up in the world, fully – due to concerns beforehand, nervousness during, and feeling troubled afterwards. About feeling anxious – hmm, what might an opposite feeling in the moment be I wonder? Could the opposite of anxiety be indifference, maybe, or confidence or even coolness? Hmm…. The fact of the matter is, though, that anxiety is just a feeling – just a thought. It is here (if it is here) and it should be honoured, or at least acknowledged, and not made wrong (or resisted) – because there is nothing wrong with feeling anxious. Resistance really is futile, and not just to the ‘outer space’ Borg. Resistance doesn’t work well on the ‘inner space’ journey, either; it just doesn’t. Anxiety is feedback, nothing more and nothing less. And you can take your anxious feelings and thoughts seriously, or you can simply notice them, like you might notice a dark rain cloud in the sky. Yes, it might mean you get wet very soon. And, yes, you’d prefer it if the sun would shine. But, it’s only weather, and more weather will be coming along shortly. Nothing needs to be done about your anxiety, or acted on, and you are perfectly safe and secure you really are.